On Saturday 10 November the 2nd annual Pura Soda Race2Stanford took place between Hermanus and Stanford in the popular Overberg, just an hour from Cape Town Airport. The athletes and their families descended upon the famous and historic sea and riverside towns just as the whales are in season and the summer holidays beckon. The R2S half iron distance triathlon consisted of a 1.9km swim in the New Hermanus Harbour which was a relatively warm 16.7 degrees. The 2 lap sea swim was followed by a brutally beautiful 90km cycle through the famed Hemel en Aarde wine valley into the predicted easterly wind. The last leg was a tranquil but hot half marathon around the quaint village and along the Stanford Wandelpad on the banks of the Klein River. On the men’s side defending champion Matt Trautman dominated the race to win in a modest time of 04:40:10. 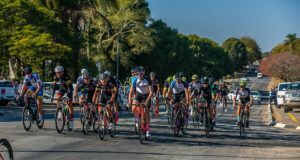 The easterly wind provided cooling relief on a hot summers day but meant a much tougher cycle as riders faced a strong block headwind for a 30km section. The already legendary 1450m ascent bike course was even more challenging in the wind and Matt’s time of almost an hour slower than his latest 70.3 distance win reflects its severity. Matt has made a miraculous recovery since his cycling accident exactly two years ago, winning the 2018 Pura Soda Race 2 Stanford off the back of his recent record setting Ironman Wales win & second position at Ironman Shanghai 70.3. In second place was uber biker Donovan Geldenhuys in a time of 04:53:24 earning him R4500. He was followed by his namesake and fellow Durbanite, the ageless coach & ex pro Donovan Van Gelder with a finishing time of 05:11:08 earning him R3000. On the ladies side the last minute withdrawal of pre-race favourite Magda Nieuwoudt for medical reasons gave her female amateur rivals a great opportunity to dice for some real cash. Ever improving Ironman 70.3 World Championships ‘podiumer’ Michelle Krebs has taken part in 5 half iron distance triathlons over the past 8 months. She grabbed the opportunity taking first place, winning herself a healthy R7500 from National Health Care for her phenomenal effort and maiden 1.9-90-21km distance win. Having won the 1 mile swim at the West Coast Warmwater Weekend triathlon in March while suffering with a knee injury Kirsten Blend is stoked to be back testing her bike and run legs. Unsurprisingly she battled on the run after some mechanical issues on the ride, yet the colourful character still managed a convincing second place in a time of 06:35:35. There was talk about Bianca Tait being well suited to tough courses since she is known to most for her success in the gruelling Norseman endurance events. She delivered on the hype beating Sandi Brown & Larissa Krajasich to take 3rd in a time of 06:52:49. A heartfelt story was that of Chris Ndaba, a recovered drug addict who has taken on a healthier addiction in the form of endurance sport. 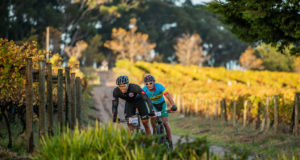 The ‘brutally beautiful’ Pura Soda Race2Stanford was his very first triathlon and his success has revealed that he plans to take on Ironman South Africa and the Cape Epic in due course. 4 teams of young students from the University of Cape Town came out to take part and support. They managed to hold onto the solo leaders for much of the race nailing first and second place in the team category with some impressive individual swim and bike times of 23 minutes and 02:45:49 respectively. The A team swimmer Simon Hadden has hopes of the 100m in Tokyo. Every single finisher was well prepared and as they finished looking broken they each commented on how much they enjoyed the challenged. Their day after comments on social media reinforce this feedback. From speedy prize winners to those who finished right on the cut off mark 9.5 hours later, the positive sentiment has been unanimous.